The Rotary Club of Apopka Scholarship provides financial assistance to an Apopka High School or Wekiva High School senior who plans to attend a College, University or Technical School. The application process will open March 11, 2019, and all applications must be sent to PO Box 7, Apopka, FL 32704 and be received by April 15, 2019. Individuals selected will be notified by email not later than April 30, 2019 and will have 7 days to acknowledge receipt. Recipients will be invited, and must attend, as guests at a weekly meeting that is held on Thursdays with the Rotary Club of Apopka at the VFW Community Center at noon to formally accept the scholarship. The scholarship will be awarded directly to the school you attend. We will verify enrollment. There will be five $1,000 scholarships awarded. •	Must be a citizen of the United States or Legal Resident. •	Must be a high school senior and residing in the Apopka area. •	Must attend a College, University or Technical School. •	Provide two letters of recommendation from teachers, counselors, administrators, or business leaders. •	Write an essay of not more than 300 words that explains your understanding of the Rotary Four Way Test and how you have incorporated it into your life. •	List any leadership positions or participations in church, community or volunteer organizations. •	List of all awards received. •	List any past involvement with Rotary or any Rotary related organizations. 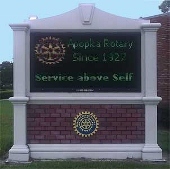 •	Provide a fully completed Rotary Club of Apopka Scholarship Application Form.